NS5100B Black Anti Slip Grit Tape, 60 grit. No Skidding NS5100B Series anti slip tapes is an excellent and economical choice for most general purpose indoor and outdoor requirements for slip resistant grit tape. 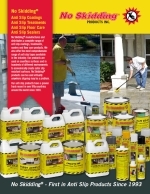 Manufactured from a durable 60 grit aluminimum oxide formulation that results in a durable and reliable result. Available in: Black or Clear. 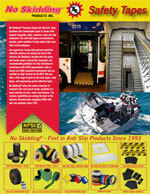 Economical and simple to apply anti slip high traction safety tape that applies firm traction and durable protection that is suitable for recreational areas such as ramps, playgrounds, pool areas, RV's, stairways, work areas, snowmobiles, scooters, construction machinery,vehicles, machine shops, hazardous floors, industrial equipment, lawn equipment, trucks and trailers. No Skidding® NS5100 Series anti slip tapes are an excellent economical choice for most general purpose indoor and outdoor requirements for slip resistant tape. Manufactured from a durable 60 grit aluminum oxide formulation that results in a durable and reliable result.